Bold angles in a dark espresso finish lend a contemporary flair to the Kelton occasional table collection. 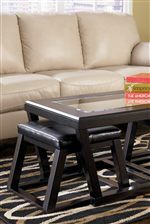 Sleek and sophisticated, the unique cocktail table with nesting faux leather ottomans offers tons of style and function to your living room. 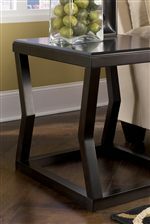 Made of select veneers and hardwoods solids, the cocktail table has a beveled glass insert top for add style that is also easy to keep clean. You are set to relax or entertain with the refreshing look of the Kelton accent tables for your home. Browse other items in the Kelton collection from Beck's Furniture in the Sacramento, Rancho Cordova, Roseville, California area.